For Caitlin Foord, heading out to wash her car at the conclusion of the interview is an unexpected luxury that has been beyond the 21 year old for the past five years. Since bursting onto the national scene with Sydney FC in 2010 and then internationally with the Matildas in 2011, the defender has lived most of her life out of a suitcase as she traversed the globe from Japan to Germany, the USA and Canada. “I have been home for about six weeks now and it’s actually nice to settle in one place,” said Foord. The extended home break in her picturesque home town of Wollongong, 90 minutes from Sydney, has been the byproduct of a decision to not return to Sky Blue FC in the National Women's Soccer League for the 2016 season. After three seasons with the New Jersey side, Foord was hoping for a sea change but, due to the at times complex NWSL player rights and trading system, it went awry. "I was looking to go back to the NWSL but some things didn't work out the way I wanted it to," she continued. "The ultimate decision for me was to just stay at home." 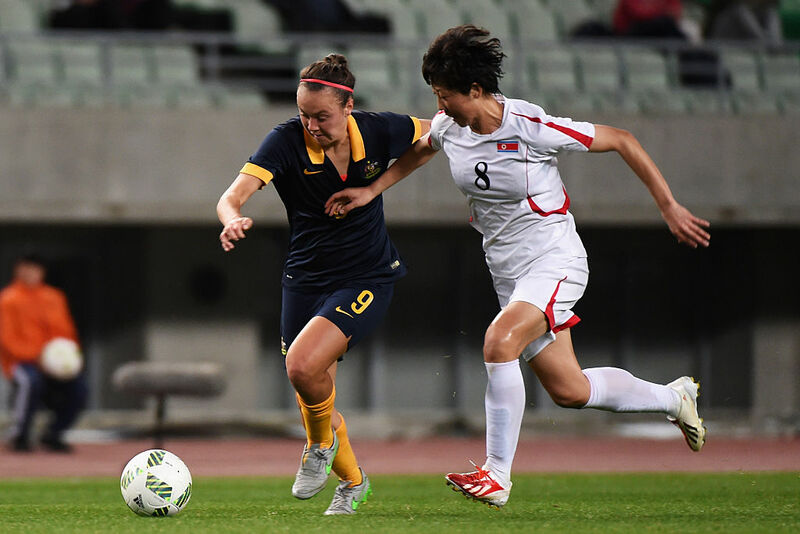 That decision to not head overseas is part of the maturation of Caitlin Foord as she looks to take more control of her football career and its direction. "When I was younger and something would come up, you would just kind of take that for the experience. Everything now is more thought out. Even my decision of not going overseas, that was me who made the decision." "I think I am taking more control in what I want to do and where I think I can get better in my football." For now Caitlin Foord is content, even happy, to use Australia as her base to prepare for a seventh international tournament. Fully recovered from a broken collarbone, while not in the club environment, Foord's week is nonetheless full, dispelling her concern about a lack of match fitness. “The main thing I was worried about was game time," she said. Tuesdays and Thursdays see her training with the local Wollongong first grade team with the rest of the week made up of regular gym sessions and Wednesday night matches with the National Training Centre. She is not the only Matilda involved in those NTC games with several of the NSW based Matildas including Michelle Heyman, Lisa De Vanna, Chloe Logarzo, Caitlin Cooper pulling on the boots. Added to that schedule are the almost weekly Matildas camps at the Australian Institute of Sport with the Australian based players under the careful eye of coach Alen Stajcic and the Matildas fitness staff. The other benefit of being at home is the mental respite. Conservatively, since 2011, Foord has played over 150 matches at club and international level. Those have included two FIFA Women's World Cups, two AFC Women's Olympic Qualifiers, two Cyprus Cups, three NWSL seasons, four W-League seasons and several Matildas tours. That she has managed to stay relatively healthy is a testament to her athleticism, fitness and medical support at club and national team level. Mentally, however, it has taken a toll on a player that chronologically is still young, making the reduced load a blessing. Re-igniting her love for the game has certainly made Matildas camps more enjoyable. 72 days out from Australia's opening match against Canada, Foord's full focus is on being prepared for her first Olympic Games. Although she played every minute of the World Cup campaign as a full back (left and right back), the AFC Women's Olympic Qualifiers saw the versatile footballer feature more prominently up forward. As a former striker at Young Matildas' level, it is a familiar position but one she is working to refine. "It's just getting used to playing up there again," she said of moving up the park. "It is a different mindset to defending so I am trying to refresh my mind on how to play up front again." "I guess I am most looking to improve on my finishing so I have been working hard at that." "That has been one of the advantages of being at home as I can practice my finishing on my own, where if I was in the US or in a team, I would have more limited time to do so." Asked if she had thought of any goal celebrations if she added to her tally of five international goals, the Shellharbour native was quick to laugh. "I haven't thought anything through," she exclaimed. "If I could get the ball into the back of the net I think I would be happy enough with that!" "I would probably be so in shock that I scored that the celebration wouldn't even come out." As for the Matildas as a collective, the young veteran believes they are on track despite the geographical scattering of several of their core players. "Obviously that is quite a bit of the squad away so it’s a bit different. In saying that, everyone that is here is working extremely hard. " "As it gets a bit closer we are together a month before the first game in Sao Paulo, so that preparation will be just as good as the ones for our qualifiers and the results spoke for themselves there." While it's all about Rio for the moment, Foord is aware that good performances, with the eyes of the world on her, could have an impact on her club future for the next couple of years, particularly with "down" years for the national team. "I definitely want to go overseas but I am not too sure what I want to do or where I want to go just yet." "I will wait for the Olympics to see what options I do have but at this point I am pretty open to all options." "At the end of the day that is the main reason for my decisions. If the environment is one where I think can get better then I will follow that path."